Rabbi Yits’hak Luria, also called “The Ari”, was born in Jerusalem in 1534, about 40 years after the Jews’ expulsion from Spain. His mother came from Spain and his father came from Russia but passed away shortly after he was born. After his father’s death, his mother decided to immigrate to Cairo, Egypt. There, she lived with her brother who served as the Chief of Custom. He was a very wealthy man and under his auspices, the Ari was educated by the greatest teachers of that time including RADBAZ (Rabbi David Ben Zimra). It is widely known that the Ari was a great scholar who loved to learn and always get to the root of everything he was interested in. In the archives in Cairo, there is evidence of the Ari’s occupation – merchandising spices. Also, it is believed that one day, accidentally, he found a copy of the Zohar and he started to learn Kabbalah. As described in many stories, his great interest and study of Kabbalah led to the revelation of the spirit of Elijah, the prophet to him. Elijah taught him all of the secrets of Kabbalah. In 1570, he also told him he should leave Egypt and go to Israel to the city of Tsefat (Safed) in the Galilee, Israel where he would meet a man named Rabbi Haim Vital. Elijah the prophet told him that he needed to teach Rabbi Haim Vital all of the secrets of Kabbalah and that this was his life mission and the reason for his coming to this world. 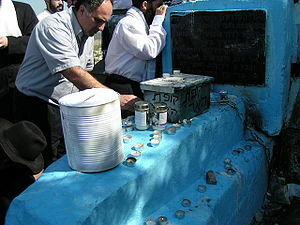 The Ari passed away in 1572 and he is buried in the old cemetery of Tsefat in a burial plot along with the great sages of Tsefat.